I love a good salad. This one was a favorite of mine last spring, and I have been thinking about it all winter. I bought bunches of radishes at the farmers market last weekend and they have been calling to me from the crisper ever since. Finally I got around to slicing them into thin rounds, stepping out the back door for a handful of herbs, and shaking up a jar of dressing. Easy as that. Here’s what this salad has going for it: Crunch. Salt. Zing. Tang. Every green salad is an opportunity, friends, and one that I hate to see wasted. So spend a few extra minutes, chop the herbs, make your own dressing. This salad is a nice reward. 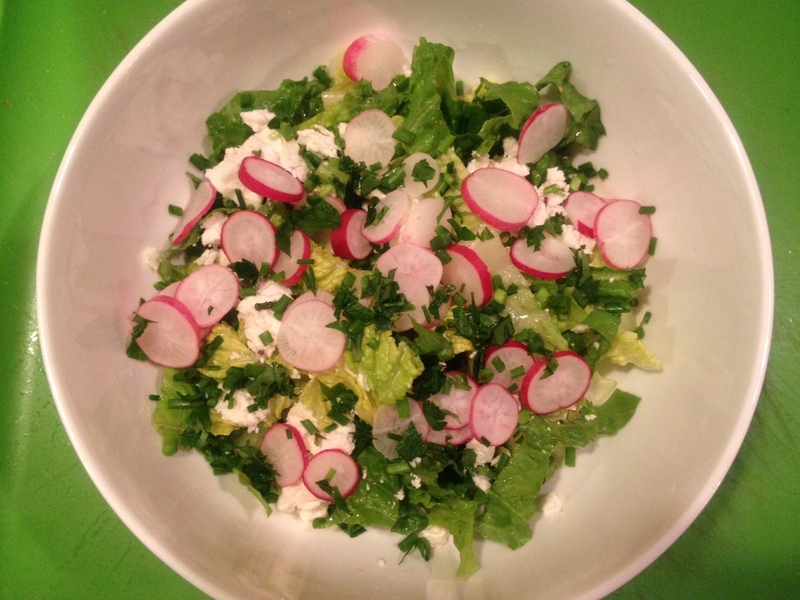 Green Salad with Radishes, Feta, and Fresh Herbs: Toss a head of torn lettuce with a few spoonful of coarse mustard vinaigrette (recipe below). Top with thinly-sliced radishes, crumbled feta cheese, and a generous handful of finely-snipped fresh herbs (I used mostly chives and parsley with small sprigs of thyme, lemon thyme, and oregano; you can use whatever you have handy). Coarse Mustard Vinaigrette: Make dressing in a small jar by combining 3 Tb. olive oil, 2 Tb. white wine vinegar, 1 Tb. coarse mustard, 1 tsp. sugar, salt, and pepper. Put the lid on the jar and shake to emulsify. I always like to dip a lettuce leaf into my dressing to taste it–enough salt? More mustard? Good, you’re set. This entry was posted in Salads, Uncategorized on May 1, 2012 by emmycooks. It’s just beautiful! Sadly, our radish “season” here on the ranch is done so this will have to wait a while! Oh boy…we’ve got broccoli ready…spring onions, carrots are just about done…potatoes soon. Can’t go wrong with feta in a salad! This sounds perfect for the quickly encroaching warm weather–crispy crunch, hooray! We did all wear our down coats here today. But that doesn’t stop me from feeling like it’s salad season once the sun comes out! Looks wonderful. I love radishes. I have grown to love radishes, but I didn’t always! I think I’m just more familiar with how I like them now. In salads, thinly sliced in sandwiches, sauteed in butter! Do you have other favorite ways to eat them? I have rows coming up in my garden and my CSA is always radish-heavy at the start, so I’m preparing for an onslaught! I love radishes too! So crunchy! And I like their bitter spiciness! Around this time, I love them in chopped salads too. With spring onions. Your salad looks great. Such pretty colors! this shouts spring to me! I love radishes, they just add so much colour to a green salad! funny, I like my radishes AND spring onions/chives slighlty cooked so they lose abit of their spiciness instead, hmm.